I really enjoyed this post about top director’s student films. It helps students see what worked and what didn’t. They are timeless in idea and technique with resources available to them. 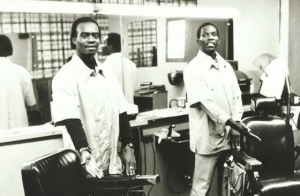 Click on the above image (from Spike Lee’s Joe’s Bed-Stuy Barbershop: We Cut Heads) for the article and films! This entry was posted in Cinema, Filmmakers, Motion Picture Film, Production, Short Films, Student Films and tagged lucas, lynch, shortfilms, spielberg, spike lee, studentfilms. Bookmark the permalink.